A body that had been trapped under a sunken tourist boat in southern Thailand was retrieved on Sunday, according to Phuket government and the Chinese Embassy in Thailand. The body, the last to be retrieved after the boat accident killed 47 people, was brought to the surface after a nine-day joint operation between Chinese and Thai rescue forces with the help from five volunteer divers from various countries. The body was retrieved at about 6:35 p.m. local time (1135 GMT), and would be transferred to a local hospital in Phuket for further identification. 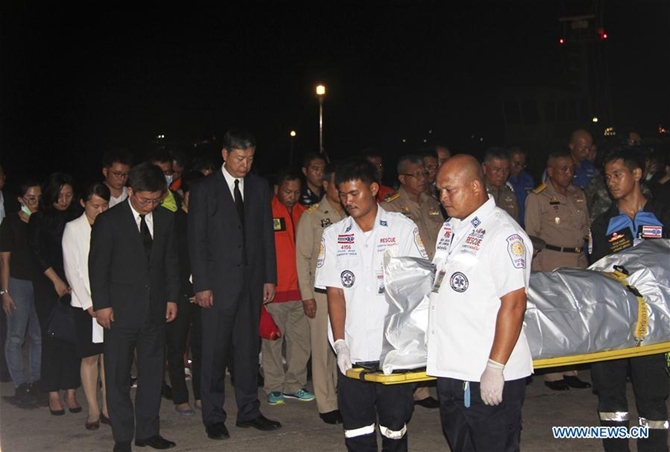 From the body's clothes and appearance, it is believed to be one of the 47 Chinese tourists that died after their boat capsized in Phuket waters on July 5, Phuket Governor Norraphat Plodthong said. Two tourist boats, Phoenix and Serenata, were overturned in rough seas in southern Thailand's Phuket on July 5. All the 42 passengers on board Serenata were rescued. Forty-two tourists on board Phoenix were rescued and 47, all Chinese tourists, were killed.